AFL Hyperscale, an organisation that provides optical fibre and copper cabling infrastructure for large data centres, and Light Brigade, AFL’s training and education division, came together to raise funds for their annual United Way campaign. 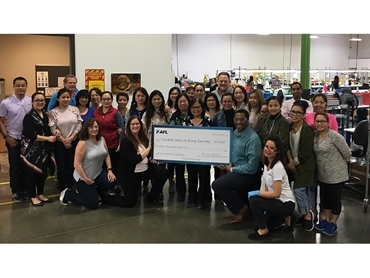 Thanks to the efforts of associates of both the organisations as well as AFL’s Community Outreach Program, the campaign was able to raise $14,000 for United Way of King County, with the donation increasing by more than 15 percent over the previous year. This year’s United Way campaign theme was ‘Lights. Camera. Take Action’, with associates learning more about the organisations supported by United Way through its program. Through AFL’s Community Outreach Program, donations were matched dollar-for-dollar up to $100 and for those new to the United Way campaign, donations were matched dollar-for-dollar with no limit. AFL locations in New Hampshire, Massachusetts, South Carolina and North Carolina participated in the campaign, which generated $325,000 in donations across five states. AFL Global has an extensive Community Outreach Program that provides grants, sponsorships, associate engagement projects, disaster relief and more. For additional information on AFL and its community initiatives, visit www.AFLglobal.com.